There are so many way to control how you press the shutter on your camera, I had to do a deep dive into the world, and try to make some sense of it all. Like most gear reviewed here, the mission to find the best in a category comes from a need. Problem > solution type of situation. Now, you may wonder, “what the heck do i need to add anything else to the camera?” My self timer works just fine, thank you very much. I wanted to take a shot of me holding a product, and didn’t want to self timer it. I’m an adult and no need to run back and forth to the camera. I was brought up with a shutter release cable, and now can do all I need, and more, via devices and apps. There are other things you may want to do that can be sooo much better controlled remotely. Here are some of the operations that you may use one of these remote devices for: time-lapse, focus stacking for close-ups, long exposure, remotely control exposure and focus, self portraits (not gonna say selfie!) HDR (yechhh! ), and with some of the units: wireless tethering. Yeah, that last part is pretty cool. Actually, very cool. At the end of the post, I’ll let you know my controller of choice, based on my needs. One thing I want to point out at the very beginning, is that these units are really only working for Canon or Nikon cameras right now. First off, the premier company currently helping you get your tethering act together is Tether Tools. The best, seriously. This type of product fit perfectly into that category. A couple of years ago, they had a controller that was released the same time as CamRanger, another control unit, came out. The product they were going to distribute got mired in paper work, and went away. CamRanger has pretty well owned the space. 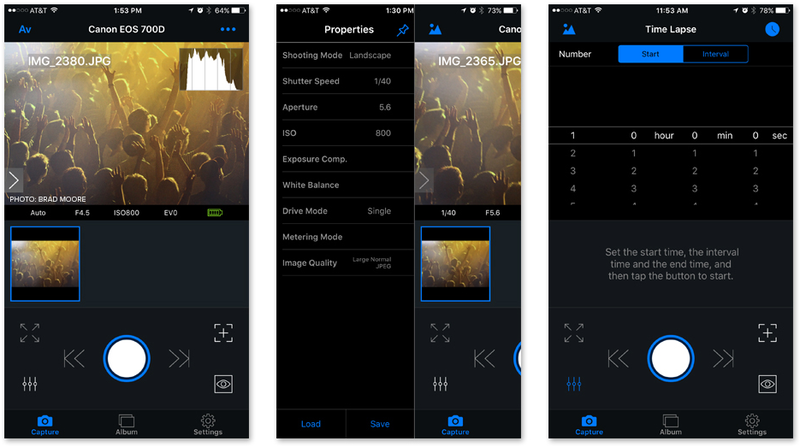 With a Wi-Fi network created between the device and the camera, the app lets you do everything you may want to do: Aperture, Shutter Speed, ISO,WB, even touch screen focus with stills or video. The device can be charged via USB, and you can add extra batteries for continual use. Really good, and really smart. The unit is a little bit clunky, but it works. About $300. No way to attach to camera,like a hot shoe or tripod thread, but you get a pouch you can hang from your tripod. Not a deal killer, although not ideal. 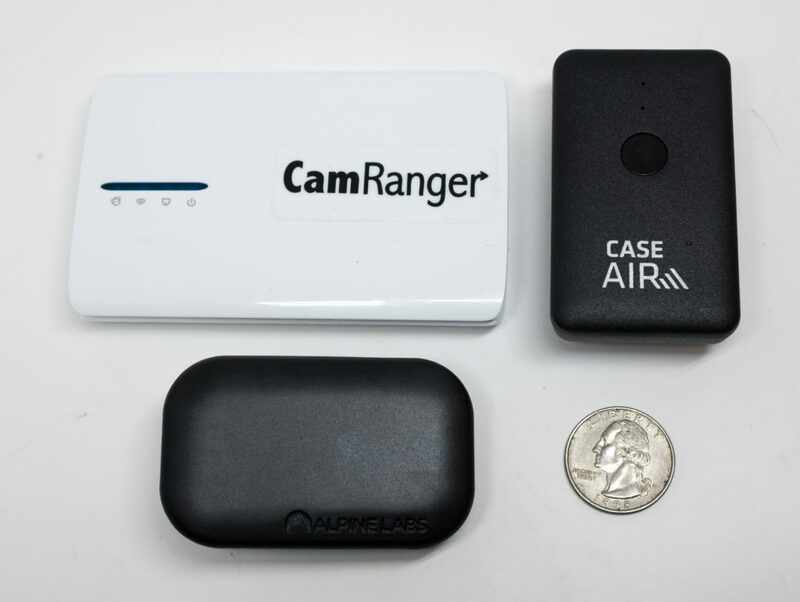 Here is an overview of CamRanger. So, we waited. 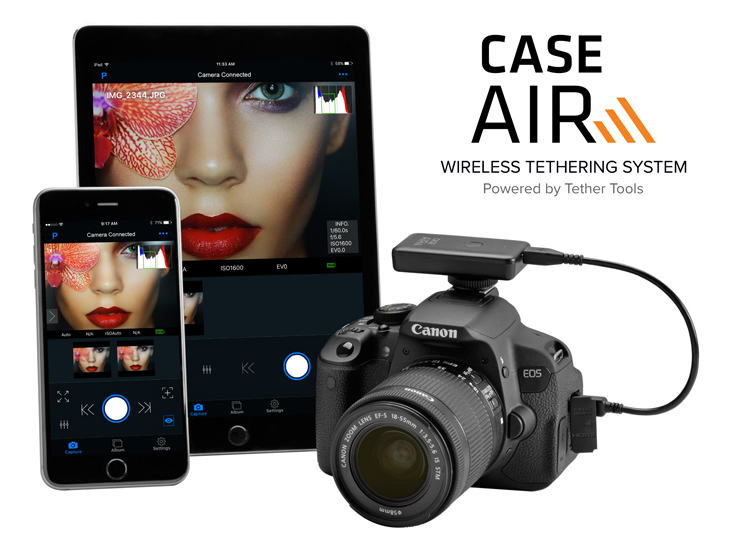 And then TetherTools announced at PhotoPlus Expo this year, the Case Air. Now we’re talking improvement: Smaller size, discreet black color, 1/4-20 mounting, only $159. Clean mounting to your hotshoe, or an optional long bracket to share space with a speedlight. The app you use is super easy to set up. It read my Nikon D810 immediately. I was able to see the image on the phone and the tablet easily. And it controls all of the camera operations mentioned earlier. And you get Focus Peaking! I’ve never understood why the DSLR manufacturers left out focus peaking, especially if they want you to use the cameras for video. I’m sure it’ll come. Someday. Until then, use the Case Air. Now the unit is rechargeable. supposed to last about 6 hours. This is a main difference between the Case Air and the CamRanger: CamRanger allows you to swap out batteries, as I mentioned earlier. The solution is to get into the Case Relay power system, which will be reviewed in the next post. A tool that should be in every kit. Anyway, you can, with an additional cable, keep your camera and the Case Air charged, by using an external battery for a looooong time. These 2 systems, kind of do the same thing: control your camera from a phone or tablet. Attach the device to your camera, transmit to an iPhone or iPad, and you are tethered wirelessly. Live view is standard on these devices. One additional thing that the Case Air boasts, is it’s ability to share images as you shoot, with distant clients. They both use Wi-Fi connection made between the unit and your device, to operate. Price difference, size, app design are your choices here. Then we also have the Manfrotto Digital Director. 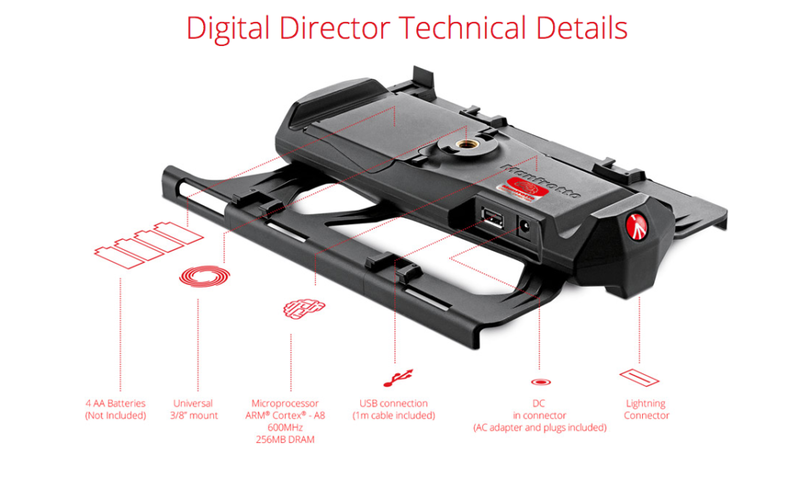 To make sure you are seeing a great, large image, this device employs a frame that is made to hold an iPad, or a Mini, uses 4 additional AA batteries to operate the system, and you need an articulating arm to connect to your tripod. With a hard wire connection to your camera, it should give you a fast, high quality extension of your DSLR. And it does, giving you jpegs in real-time. No RAW. Use this unit as a field monitor, and you will be happy. There is a 10ft max on cabling, so it is a little limited in the sharing part, although you can email, or share on social media from the unit. Another advantage is that you get focus peaking. Just like the Case Air! You know, when the part of the image that is in focus is outlined in either white, yellow, or my preference, RED! This is one thing that DSLR manufactures really should have added to their cameras, but here you have it. I could get starting at how great the Atomos series of recording monitors are, with focus peaking and so much more, but I’ll leave that for another post. And they are not controlled by an app. Yet. Different product for different uses. Back to the DD: It is a large setup, with a rig frame. Started out at $500, and was just reduced to about $300. They know there is competition. You’ll need to add the articulating arm, for about another $90. And something to screw it into. You can use with an iPad mini, and shave about $30. off the cost. And if you don’t need live view, but want a lot of the camera control features like time lapse, HDR bracketing, long exposure, you can check out the Pulse. At only about $100, it works on Bluetooth, and you can control the camera and review the images, after you shoot with it. I used it to shoot myself with some products for a review on the site, and it did exactly what I needed it to do: Took a photo, review the image, and let me adjust exposure without going back to the camera. As advertised. and about as small as the Case Air. So there you have it. 4 different devices to control your camera remotely. From $100-$300 you have a choice depending on your needs. I’ve owned a CamRanger since I first saw it at PhotoPlus Expo a few years back, and it does the job. The Manfrotto Digital Director is a bit large for what I need. The appeal is having a field monitor, control device, in a frame made for it. The Pulse is limited, but serves it’s purpose well. And not a wallet buster. The new addition to the kit is the Case Air. It does everything I need in a very small package. The only downside for me was the power question, but I’m into the Case Relay power system, so that became a non-issue. 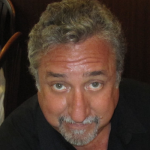 Tether Tools has a home run with this!